We love the Xerox program because they offer what they call their “Total Satisfaction Guarantee.” What this means, in a nutshell, is you won’t be stuck with a lemon. If the copier were to keep having maintenance issues, they would replace it for free. It is an awesome way to have peace of mind that the copier you are buying will last for years. We sell copiers with maintenance contracts of 1,2,3,4, or 5 years. It is totally your call. These copiers are equipped to work with The Cloud. With services like Dropbox and Google Drive as well as apps on your phone, you can be productive anywhere. One of the things you may want to do before giving us a call is to get a copy of your current lease contract ready. 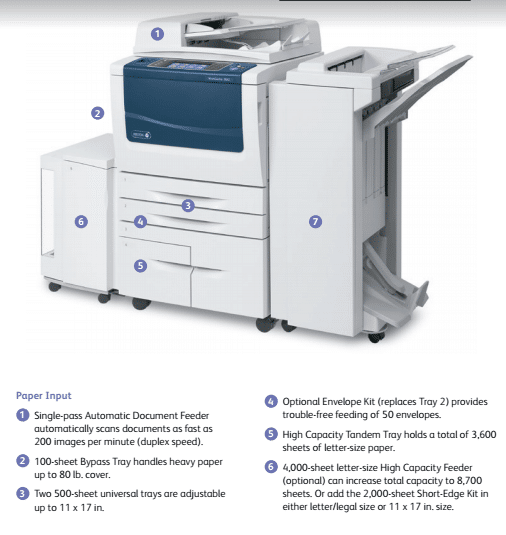 This helps us to be sure we can keep your costs low as well as avoiding the awkward situation where you are ready to get a new copier, but you cannot get one based on your current contract. If your situation is bad, we can even help you out of the contract. If you need a copier in Colorado Springs, please give us a call. We sell new and used copiers. We do leases as well as purchases. We are here to help you.